OMAHA, Neb. (CNS) — It’s families helping families. That’s the bottom line as parishes and Catholic ministries step up to help refugee families — most recently, several from war-torn Syria — adjust to a new life in the United States. “We reach out to our vulnerable brothers and sisters,” said Kaela Volkmer, who chairs the social teaching ministry at St. Wenceslaus Parish in Omaha and helped welcome a Syrian family — Ahmed and Sahar Al Kango and their three boys — two days before Christmas. As part of reaching out, Volkmer and others put on a party Feb. 12 at St. Wenceslaus Church’s social hall for the Al Kangos and about 160 other Syrian refugees in the Omaha area. They were among those sponsored through Omaha-based Lutheran Family Services of Nebraska or the Refugee Empowerment Center by people of several faiths, such as Catholic parishes, Beth El Synagogue, First United Methodist Church and Countryside Community Church. It also was an opportunity for the Syrian community, which is just beginning to form in the Omaha area, get to know and support one another, Volkmer said. Together with refugees and their support teams, more than 300 people gathered in the social hall. Cookies, fruit, cake, coffee and tea were among the snacks, and there was face painting, arts and crafts, music and dancing. While celebrating the moment, families and others could not forget the reality of the violence they had fled as well as President Donald Trump’s temporary refugee ban, put on hold because of court challenges. Omaha Archbishop George J. Lucas is among those urging people to help refugees and immigrants who come to the United States, said Omar Gutierrez, manager of the archdiocese’s Office of Missions and Justice. Helping them is a way “to live out the faith and live out the social teachings of the church in a concrete way,” Gutierrez said. The violence in Syria claimed one of Ahmed Al Kango’s brothers and his wife, who were killed in a bombing. And the Al Kango family’s home was destroyed in an airstrike in 2012 in the town of Iblid as they fled into nearby woods. 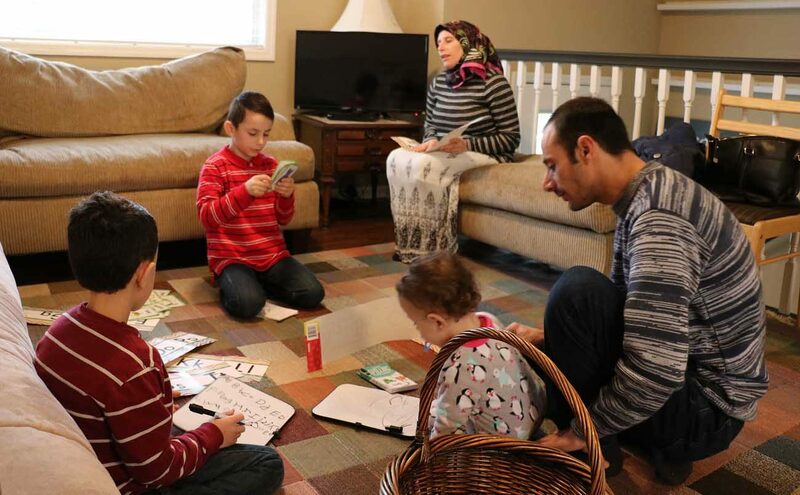 They left Syria for Turkey a year later, and are thankful now for the reception they have received at St. Wenceslaus, and the safety of the United States. All of the Syrian refugees, many of them Muslims, fled the violence of that country’s civil war. Coming to the United States with faith communities and others to help, they settle into homes, find jobs and place their children in schools. In addition to St. Wenceslaus, at least four other Omaha parishes and the Ignatian Associates in Omaha, a group that promotes the spirituality of St. Ignatius of Loyola and strives to help people in need, have been assisting refugee families from Syria. St. Pius X and St. Leo parishes are helping a family of six, St. Margaret Mary Parish a family of eight and St. Vincent de Paul is helping two families — a couple with seven children and a couple with three children. The Ignatian Associates are assisting a couple with four children.